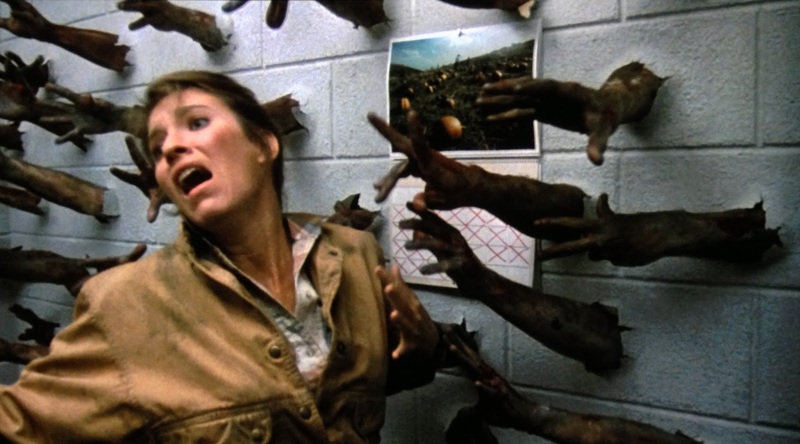 OCTOBER HORROR PARTY REVIEW #6: Day of the Dead (1985) – dir. George A. Romero | Films Like Dreams, Etc. 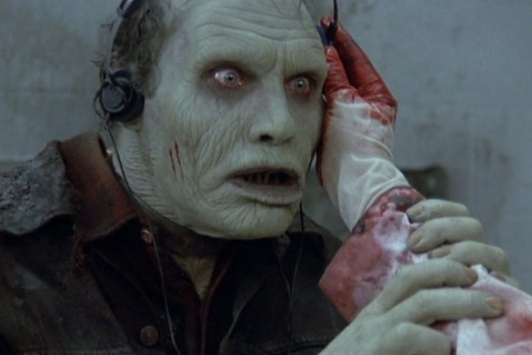 Somehow, I had hesitated on watching the final installment of Romero’s Dead trilogy for the longest time – but I’m finally glad I got around to it. It may not be technically the “best” of the series, but it is, by far, my favorite of the three. I guess I’m just really attracted to extravagance, especially in horror. The fact that two of my very favorite horrors are Hausu and Cannibal Holocaust should show this off pretty well (trigger warning on the link). And it’s certainly no lie that Day of the Dead is the wildest of the trilogy. The dialogue is louder, more menacing, and sometimes pretty goofy. The narrative itself is a bit more intricate than its predecessors’. And, of course, it’s obvious that much more care had been put into the gore effects which, in itself, is more extravagant. It certainly shows that the gradual increase in production value was put to very good use. Up until watching this film, I had always considered Night of the Living Dead to be my favorite from Romero. It did, after all, mold the look and feel of the titular zombies to a quality that is still held as the norm. Its unsettling atmosphere also holds up very well over time. Day of the Dead, however, continues with the trend that Dawn started in its shift of focus into a more character-driven survival tale of survival. Sure, it’s extremely predictable in the sense that viewers know who they’re supposed to root for, who they’re supposed to hate, and who adds no purpose to the story other than to become devoured later on. Thankfully, the ride is never a boring one, as there are certain aspects added to this story that would have probably been unthinkable in either of the previous films. In Day of the Dead, the fate of humanity is grasping at its last straws, as the threat of the impending zombie invasion becomes an increasingly serious one. For the first time, we are introduced to the idea that zombification can actually become reversed and, therefore, human society still has a chance for survival. The social commentary presented in this film, of course, is that the innate evil found in the heart of the living man only works to hinder its process; therefore, aiding in its own destruction and depletion. Sure, the character of Bub can be a bit campy at points, but the brief moments we get of his remembering his past life breathe a sense of humanness into these otherwise lifeless, mechanical beings. It also helps that the film seldom takes itself too seriously to begin with. Finally, Tom Savini’s practical effects work on the blood, guts, and gore are some of the best I’ve seen in any horror, second only to Giannetto De Rossi’s work on Fulci’s Zombi 2. There are moments in this film where Im actually dumbfounded as to how such work could even be possible – then again, I’m no special effects expert. All I know is that it’s a perfect cherry on top of a terrifically over-the-top horror. Zombie films haven’t always been my favorite kind of flicks, but I’m sure to place this particular zombie movie to high regard. 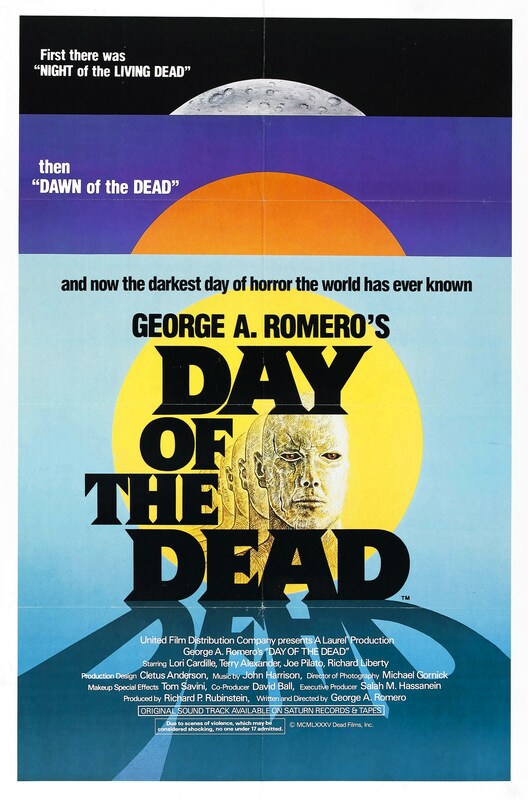 This entry was posted in October Horror Party, Reviews and tagged 1980's, Day of the Dead, George A. Romero, horror, October Horror Party. Bookmark the permalink.